Where Have These Cougars Been? The University of Houston Cougars pulled off a major upset against the No. 5 ranked Louisville Cardinals, effectively shattering their dreams of the College Football Playoffs. On the opening kickoff, the Cardinals’ Malik Williams fumbled the ball and the Cougars recovered at the Cardinals’ 13-yard line. 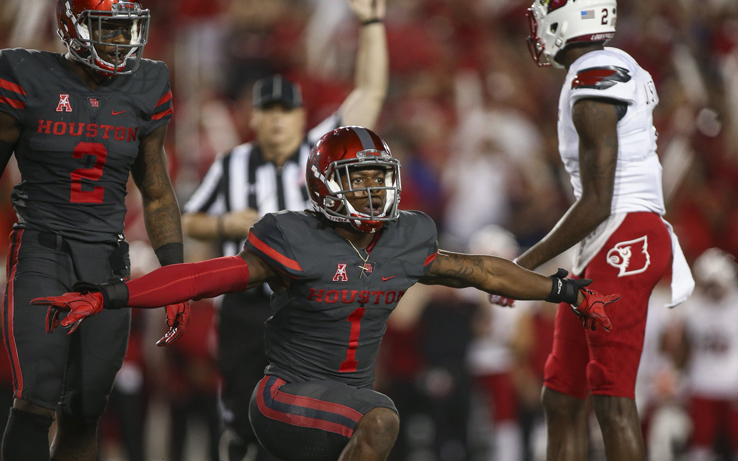 On the very next play, quarterback Greg Ward Jr. found Duke Catalon for a 13-yard touchdown. Late in first quarter, the Cardinals’ Brandon Radcliff fumbled the ball and the Cougars’ Cameron Malveaux recovered it at the Cardinals 37-yard line. That was the Cardinals’ second fumble of the game. Three plays later, Ward Jr. found Chance Allen for a 25-yard completion. The Cougars’ Ty Cummings connected on 33-yard field goal. The Cardinals’ offensive line was having trouble hearing, so in the first quarter alone, they had three false start penalties. The Cougars led, 10-0, at the end of the first quarter. “The special teams set the momentum early when they popped the ball out on that kickoff,” said Coach Tom Herman. Coach Herman capitalized on the momentum initiated by the special teams, making a gutsy call early in the second quarter to fake the punt, and resulting in punter Dane Roy connecting with Byron Simpson for a first down. Two plays later, Ward Jr. connected with Catalon for a touchdown. The Cougars’ Catalon was able to get his third touchdown of the first half on a two-yard scamper into the end zone. On the Cougars’ next drive, Ward Jr. performed a lateral to Bonner, who then found Chance Allen down the field for a 50-yard touchdown. The Cougars led, 31-0, at the end of the first half. After the half, the Cardinals got their offense going and were able to put a touchdown on the board, after Heisman-hopeful Lamar Jackson, found Cole Hikutini for a 12-yard touchdown. However, on the Cardinals’ second series of the second half, Jackson fumbled the ball in the red-zone, on the Cougars’ nine-yard line, and the Cougars’ Howard Wilson recovered it. After surrendering that one touchdown in the third quarter, the Cougars kept the Cardinals out of the end zone and held them to just a 26-yard field goal by the Cardinals’ Blanton Creque, early in the fourth quarter. The Cougars’ Cummings connected on a 46-yard field goal and forced an intentional grounding in the end zone, which resulted in safety, to finish out the game. The Cougars’ defense played lights out. The defense had a total of 11 sacks on Jackson, three fumbles and a safety. Ed Oliver had one of his best games of the season, finishing with six tackles, two sacks and a forced fumble. “He is an alien, beast, he is not from this world,” said Steven Taylor on Ed Oliver’s game. Lamar Jackson had constant pressure on him all game long, and struggled throughout the whole game, as a result of the relentless Cougars’ defense, but Coach Herman did not pull any punches about how he views Jackson and his talent overall. “In my opinion, that’s still the best player in college football,” said Coach Herman referring to Jackson. The Cougars have now beaten three top teams in the past two seasons. Two of those top ten teams were ranked in the top five. The Cougars will play the Memphis Tigers next week in their final away game of the season.